Offering you a complete choice of products which include stationary asphalt plant, drum mix plant and counter flow asphalt drum mix plant. 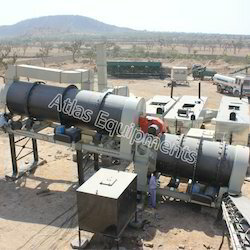 Stationary asphalt plant by Atlas can be considered as one of the most trusted and maintenance free equipment for road making available in the market today. We are manufacturers and exporters of the construction equipment used for road construction. Our technical expertise and after sales service has helped us earn solid reputation in the market as construction machinery manufacturers from India. All the three models come with option to go for bag filter or venturi type wet dust collector for pollution control. The bitumen tank sizes can be customized as oer your requirement. It is also possible to get bitumen tank with direct heating or with indirect heating system. Since our design is proven and working in many places, right now our focus is to develop a design which is containerized. This will help lower transportation costs. 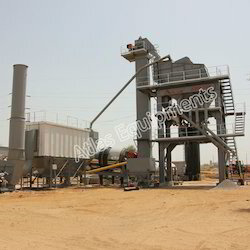 We manufacture and export drum mix plants. Our machines are built to last and perform under rough Indian conditions. Invest in a product that offers "Peace Of Mind" rather than a machine that will give you a headache. The drying and mixing drum which is the most important unit is coated with cerawool and covered by a stainless steel sheet. This helps retain maximum heat withing the heating zone and helps in reducing the fuel consumption. We also offer PLC control panel with touch screen display for mobile like user experience. Counter-flow asphalt drum mix plant by Atlas is developed for customers who are not satisfied with the quality of hot mix asphalt from the drum mixer. Counter-flow plant eliminates the problem as the quality of hot mix asphalt coming from the counter flow mixer is better than a traditional drum mix plant. This technology separates the mixing and drying process. The drying process is by counterflow technology thereby making it more efficient in terms of fuel saving and also the quality of hot mix asphalt. Separate heating and mixing zones. The mixing zone can be the drum or a pug mill type mixer. 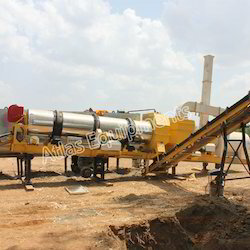 Looking for Stationary Asphalt Plant ?